The cultivation of dates, the fruit of the date palm, began more than 5,000 years ago in regions of the Arabian Peninsular, Middle East, and North Africa. Dates have been praised from ancient times for their numerous health benefits in both religious texts and traditional medicine. There are approximately 20 varieties of dates, yet only four varieties were found to have significant health benefits: yellow Barhi, Deri, Medjool and Halawi. A recent date study by Prof. Michael Aviram and colleagues from Haifa’s Rambam Medical Center and Technion-Israel Institute of Technology was published in the Journal of Agriculture Food Chemistry. The study found that dates improved triglyceride profiles, and lowered oxidative stress levels by “reducing blood triglycerides,” which “improves the quality” of blood cholesterol by reducing its oxidation.” They also discovered that dates attach themselves to harmful, oxygen-free radicals and remove them from the body. Interestingly, despite dates containing tons of sugar (80% by weight), it seems that anyone can safely eat up to three dates a day without concerns about raising blood sugar levels. However, Aviram warned that since dates do indeed have a lot of sugar, they are not recommended for diabetics, even though they do not raise blood sugar significantly. Surprisingly, a study published in the May 28, 2011 Nutrition Journal determined that moderate consumption of dates did not significantly raise the blood sugar levels of type 2 diabetics. Dates are generally considered a low-glycemic food. The glycemic index (GI) measures how quickly various foods increase blood sugar levels. Whole foods with high sugar content along with high fiber, like dates, are lower glycemically because of their high fiber content. The fiber slows the introduction of sugar into the bloodstream thus avoiding the unhealthy sugar surges associated with most high glycemic foods. The glycemic load measures the actual blood sugar rise immediately after consumption of a particular food or beverage. The lower the glycemic load, the less there is to worry about blood sugar spikes and their corresponding insulin surges. Because dates are loaded with both soluble and insoluble fiber and amino acids, they can help to normalize digestive function, too. Dates also contain minerals like copper, potassium, zinc, magnesium, calcium phosphorous, and iron, as well as B vitamins (especially B6), vitamin K, and vitamin A. Check out other health benefits of dates here. Phytonutrients (phyto – Greek for plant) are chemicals found in a wide variety of plants which function to protect the plant from environmental challenges such as germs, fungi, bugs, and other threats. Unlike macronutrients, such as a fats, carbohydrates, or proteins, phytonutrients are powerful micronutrients. Phytonutrients have been found to be highly beneficial promoters of overall health, and there are thousands of them. Bottom Line: Dates are a healthful, nutritious, high energy food that can be safely added to your diet in moderation, especially when you want to increase your stamina or crave something sweet. Note: Use organic ingredients. Skip the sugar and use only raw honey and preferably raw pastured, cream cheese, or make your own from yogurt. Bon Appetite! Thanks for sharing this valuable post. Your post contains various health benefits of the sweet fruit. I want to add some more points about the health benefits of dates. Very few people might know that sweet fruits also brimming with many of vitamins, minerals and other healthy fibers for healthy body. Dates are also known as great substitute for refined sugar. Dates also contains rich vitamins like B1, B2, B3, B5, A1, C, dietary fiber, potassium, manganese, magnesium, copper, magnesium and calcium that are of the most essential nutrients of our body. A healthy person should eat 7 dates in a day…. add in cereals, stuff with cheese or nuts….. choices are endless. The reason I love and eat dates is because this is my secret of maintaining healthy weight. …. only time I will put on weight if my dates are finished at home. 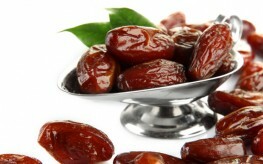 We Muslims break our fast with dates advised by our Prophet Muhammad (peace be upon Him). Could someone please change the main page title of this article? That says something about our seafood supply, and the article is about DATES! Sorry! There was an error in that newsletter we sent out. Middle Eastern countries, the Mediterranean all eat dates. I’ve been invited to people’s homes from there for birthday and anniversary parties and it’s served on large platters along with dried fruits and cheeses. All of their foods are very healthy. When I was a little girl our family drove through the California desert toward the Salton Sea and stopped at the date stores along the highway to buy and taste the large variety of freshly grown dates there with acres of huge Date Palm Trees. One date store is still there in Indio, Calif., in the Cochella Valley. It’s called Shields Date Garden and they have a fine cuisine restaurant and you can get an idea of how to incorporate dates into your dinner entree recipes. You can also buy all the dates mentioned in this article at Shields Date Garden online for about the same cost as a box of See’s Candy. One date store is still there in Indio, Calif., in the Cochella Valley. It’s called Shields Date Garden and they have a fine cuisine restaurant and you can get an idea of how to incorporate dates into your dinner entree recipes.